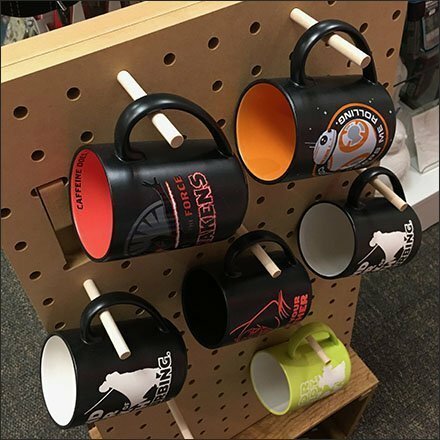 This compact Wood Peg Pegboard Freestanding Mug Display merchandises from atop a wooden crate in the aisle. And while its short stature here required a boost, the small size is an advantage if placed on a gondola shelf or countertop. See that flanges at the base and embedded in the Pegboard face lock the components together. That allows it to ship or store flat when not needed. Hookery is simple Wood Pegs that can be positioned anywhere. This Miniature Pegboard and Wood Peg Merchandising seen at a Hallmark Card Shop.